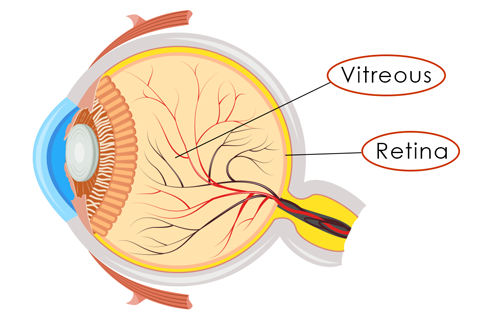 The inside of our eyes are filled with a gel-like substance called vitreous. As we get older, the vitreous becomes thicker and begins to shrink and change shape. Clumps may form and create shadows in our field of vision which may appear as specks or dots, squiggly lines, cobwebs, or clouds which move or “float” in and out of view with our eye movement. These spots in our vision are referred to as floaters. Floaters can be annoying but typically are not reason for alarm. They are often more prominent when looking at something bright such as a blue sky or a plain background such as a blank wall or white piece of paper. Floaters can indicate a more serious problem when they are suddenly more prominent, increase in number, or are paired with loss of peripheral vision or flashes of light. This may be a sign of a retinal detachment which needs immediate attention. Your ophthalmologist can diagnose floaters through a dilated exam. For this exam, dilating drops are used to enlarge the pupil, allowing your eye doctor to examine the retina and vitreous. Your doctor can assess through this exam if the floaters are indicating a more serious condition such as retinal tear or detachment. 1 Kierstan Boyd. “What Are Floaters and Flashes?” American Academy of Ophthalmology, 23 Mar. 2017, www.aao.org/eye-health/diseases/what-are-floaters-flashes. 2 “Facts About Floaters.” National Eye Institute, U.S. Department of Health and Human Services, 1 Oct. 2009, nei.nih.gov/health/floaters/floaters. 3 Marilyn Haddrill; reviewed by Charles Slonim, MD. “What Are Those Floating Spots in My Eyes?” All About Vision, Mar. 2017, www.allaboutvision.com/conditions/spotsfloats.htm. 4 Aaron P Weingeist, MD. “What Are the Bright Wavy Lines in My Vision?” American Academy of Ophthalmology, 26 Dec. 2015, www.aao.org/eye-health/ask-ophthalmologist-q/bright-wavy-lines-vision. 5 Haddrill, Marilyn. “Ocular Migraines Explained – All About Vision [Animation].” All About Vision, Aug. 2016, www.allaboutvision.com/conditions/ocular-migraine.htm.